The Market is easily accessible by car and the grounds feature ample free parking. Or, take the scenic route along the Victoria Rail Trail. The Rail Trail is 55 km in length and is used year-round for hiking, horseback riding, cycling, snowshoeing, cross-country skiing, snowmobiling and by ATVs. The trail follows the former CN rail line which was constructed beginning in 1874. The start of construction also coincided with the incorporation of the village of Fenelon Falls. 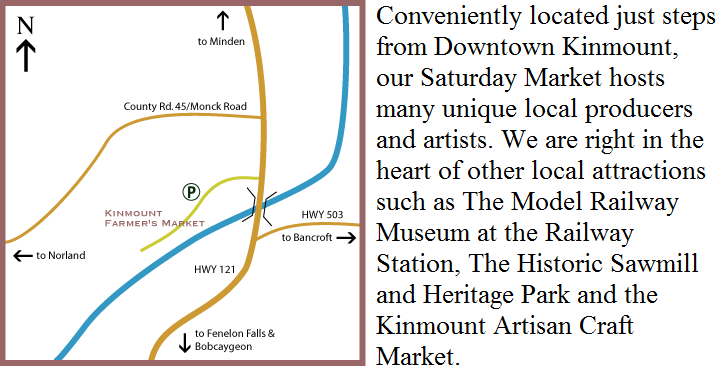 For more local history, read the Kinmount Gazette.